My day job had me working in Collins Street, and occasionally we’d get to go to the upper levels and check out the view. 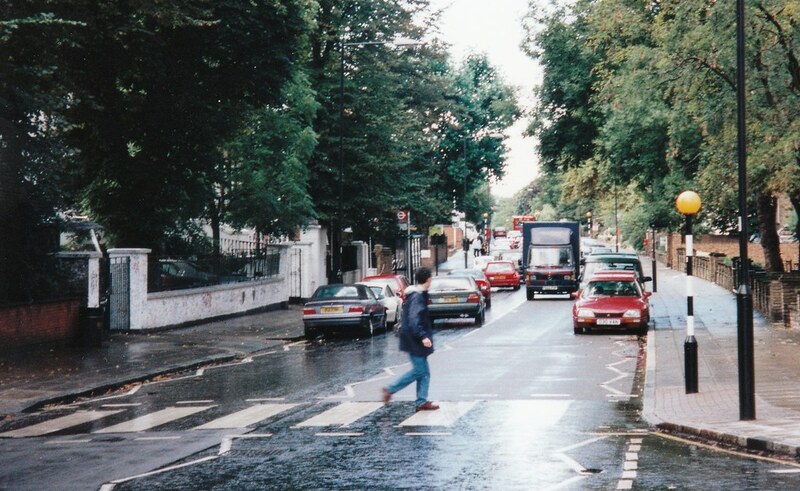 That’s Manchester Lane at the bottom left, and near the top left you can just see the Shrine. 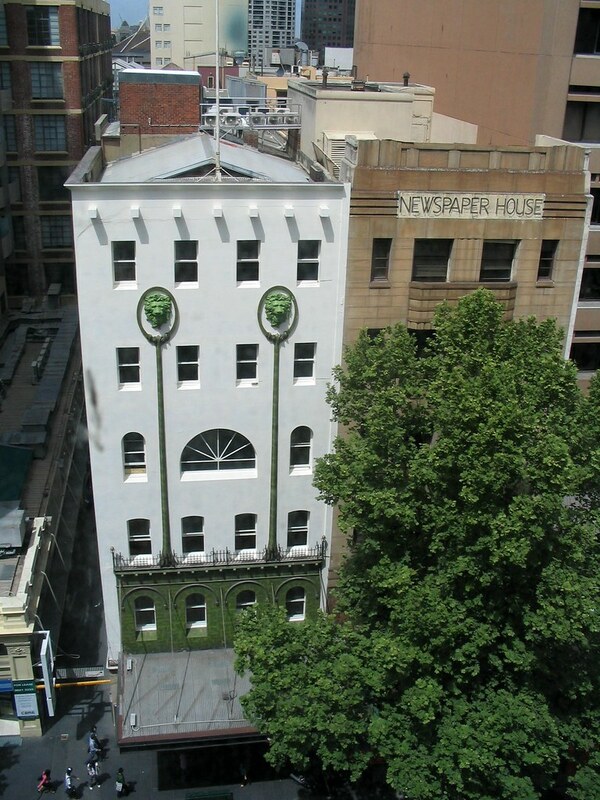 Newspaper House dates from a 1933 revamp of an 1884 building, and at the time was owned by Herald and Weekly Times. The renovation also added the lovely mosaic on the first floor. 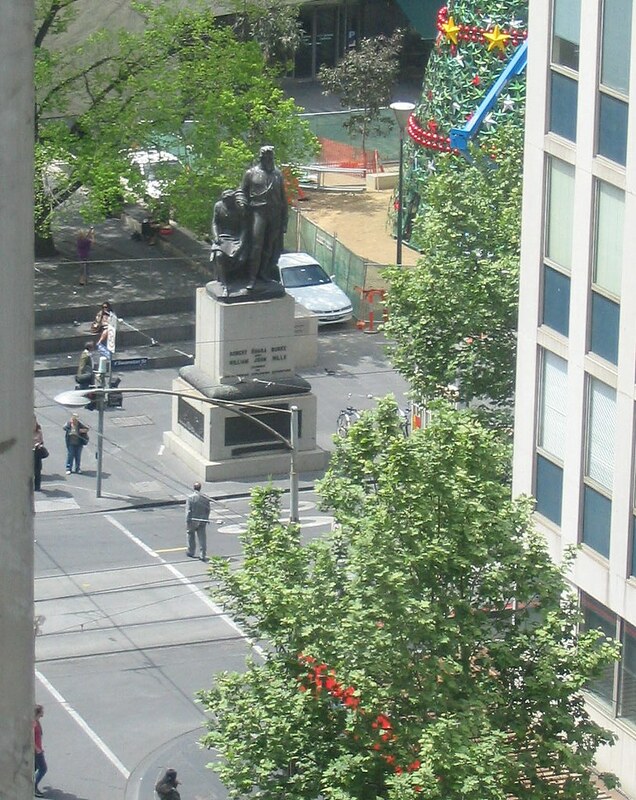 Looking down at Swanston Street you could see the Burke And Wills statue, well before it got moved to make way for the metro tunnel works now underway. How many people would know that a 108 goes most of the way of a 109? Not many I suspect, which is why the mystery route numbers were always a bad idea. 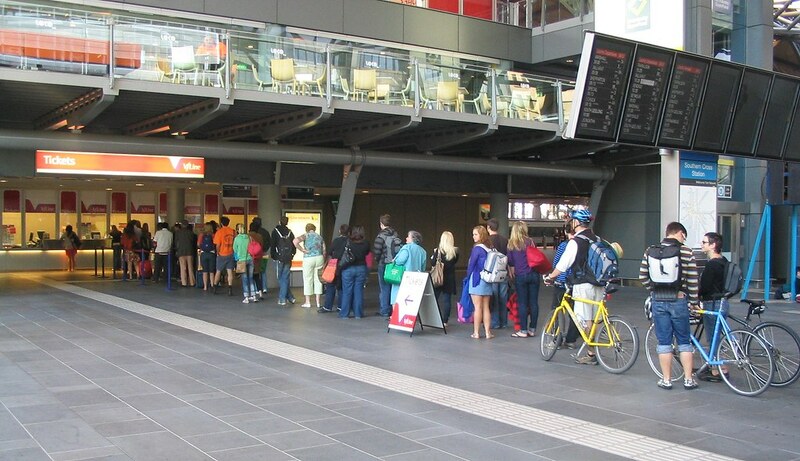 Before the days of Myki, queuing for a V/Line ticket at Southern Cross station. You have to wonder how many people actually missed the train and had to wait an hour or more for the next one because of the queue. Above you can see the flatscreens were working for V/Line… not so for suburban services, which were using temporary CRTs on the concourse. 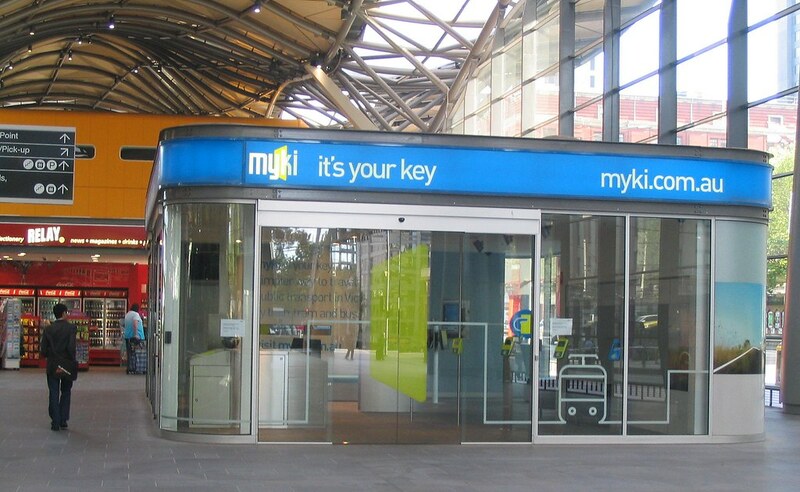 Myki had yet to start properly — that would be in December 2008 in Geelong — but it already a spot had been reserved at SoCross for an information booth. 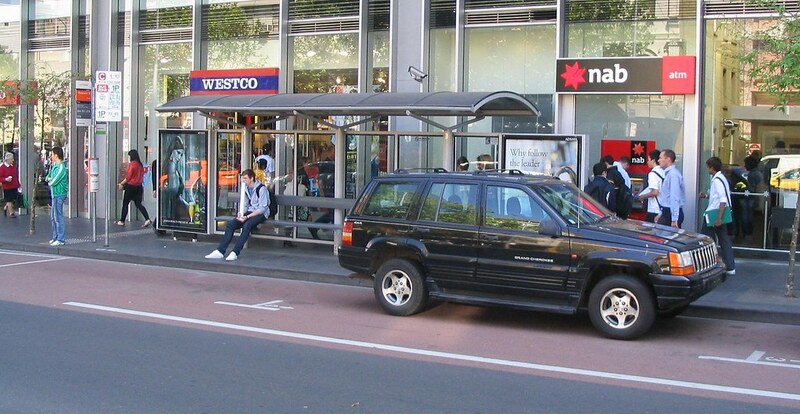 The disrespect that some traffic engineers have for public transport is evident in this photo — they had allowed off-peak parking in front of the bus shelters for one of the busiest bus stops in Melbourne. Checking Google Streetview, not fixed as of November 2017, but at least now it’s a loading zone, not general parking, except on Sundays. 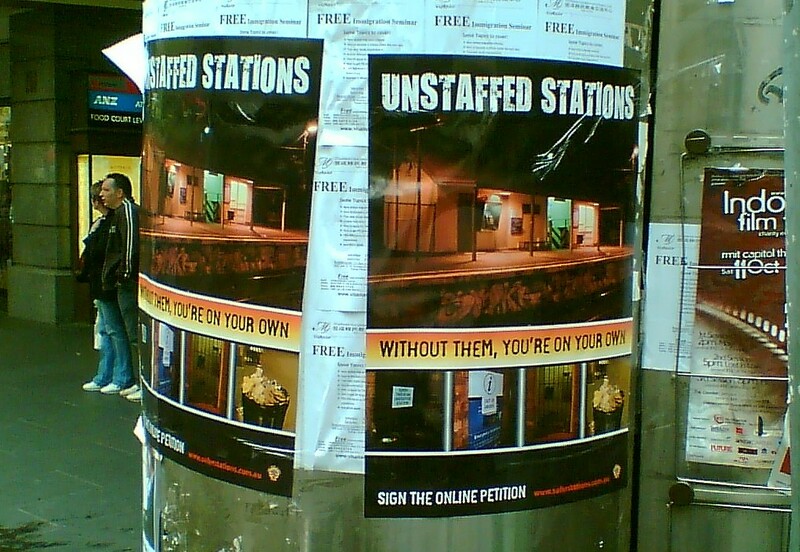 I think this was an RTBU campaign to get more railway stations to have staff. What happened instead was the rollout of Protective Service Officers, mostly after 6pm. 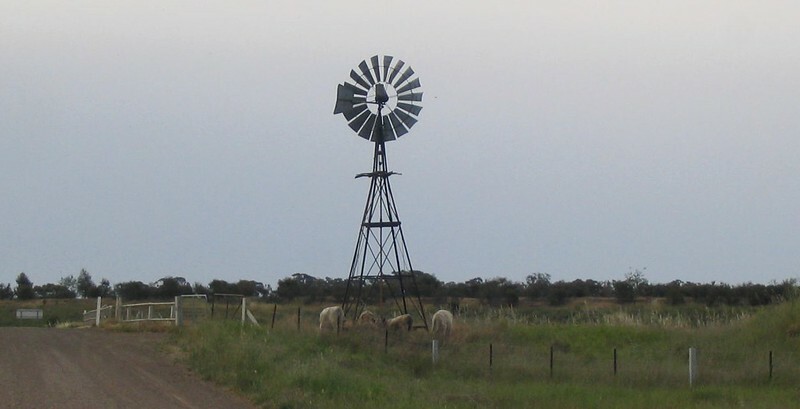 On a trip to the country, I found this wind turbine. I’m betting critics of the newer type don’t feel the same wrath at these more traditional models. 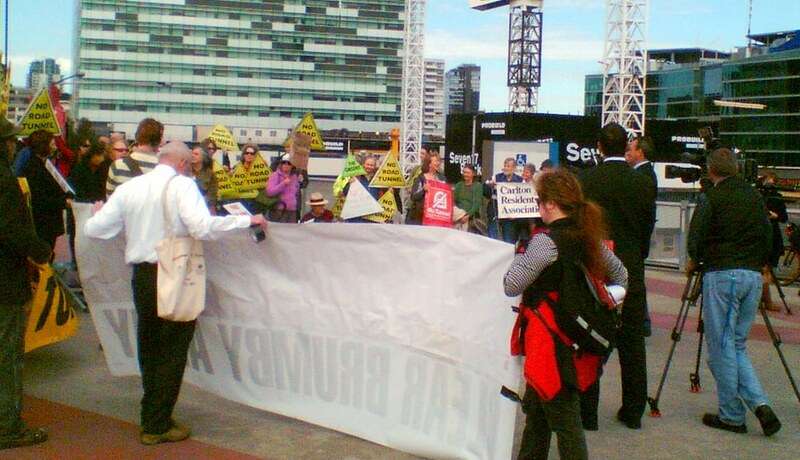 A protest at Flinders Street Station in favour of more sustainable transport. 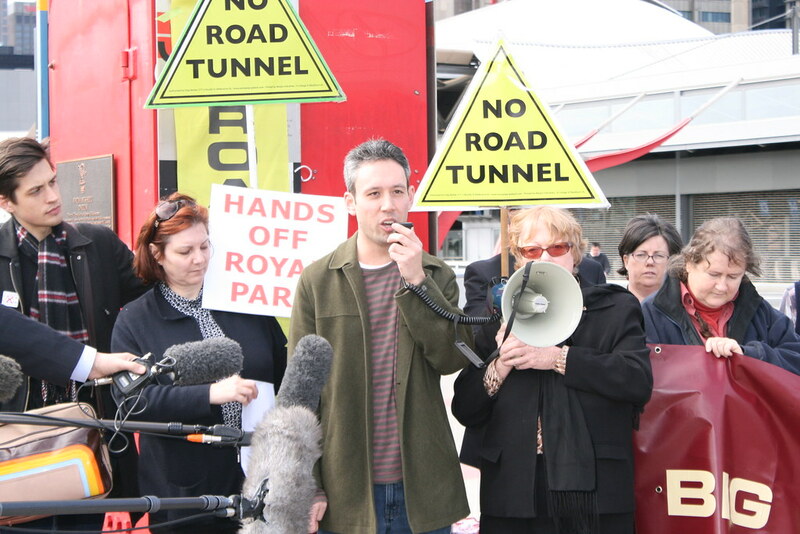 Note the “no tunnels” signs; this was in the wake of the Eddington Report, which is where the East West Link gained prominence, and was in the lead-up to the Victorian Transport Plan, which was the Brumby Government’s response. How can it be October already? 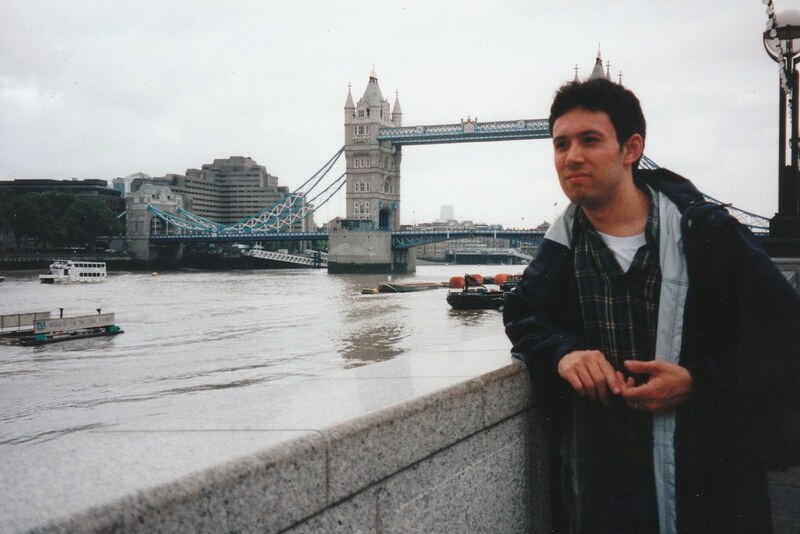 It’s still September in some timezones, so here’s my regular post of photos from ten years ago, covering September 2008. 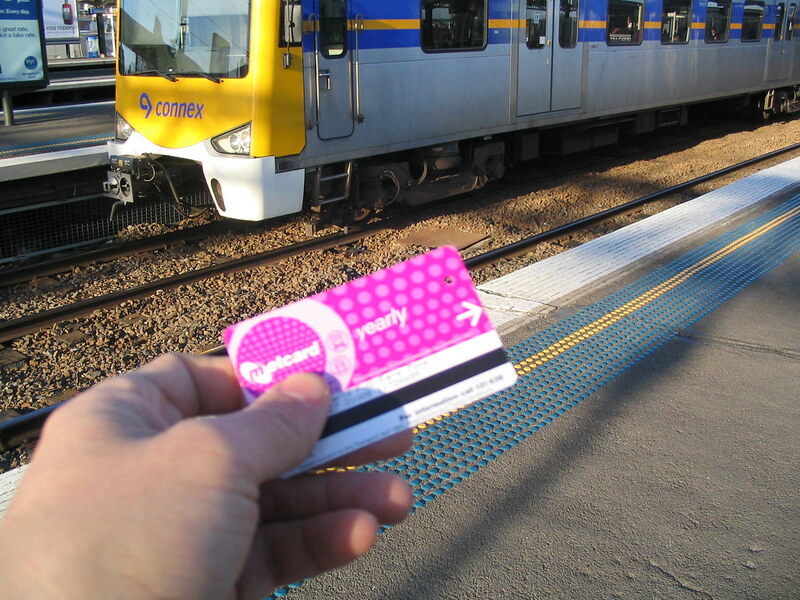 At Richmond station, I was probably trying to take a photo to help publicise the PTUA’s discount yearly tickets – but couldn’t get the ticket itself quite into focus on the old camera. Also at Richmond, one of those days when the glorious sunshine meant it didn’t matter half the platforms had no weather cover. Since then the platform shelters have been extended all the way along. 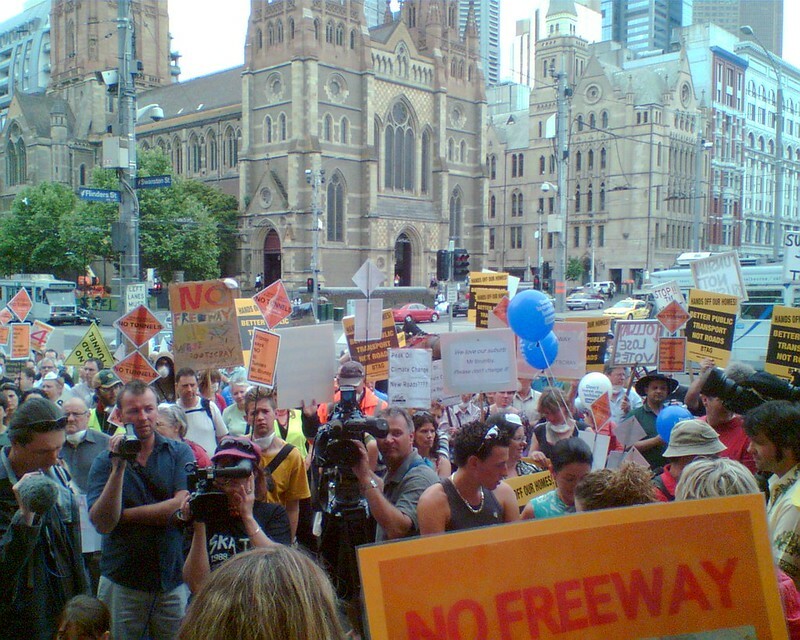 As early as 2008, there were protests against the proposed road tunnel under Royal Park – what became the East West Link. 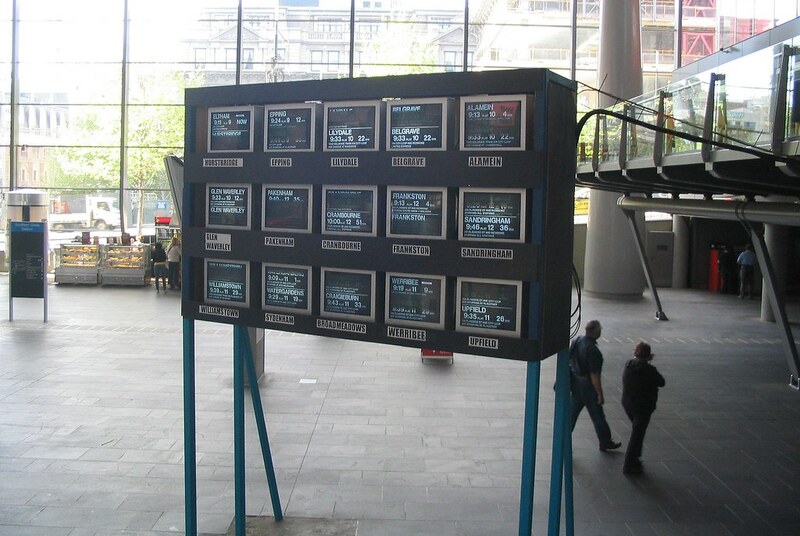 This photo taken on my old mobile phone of the time, outside Docklands stadium where a corporate do. 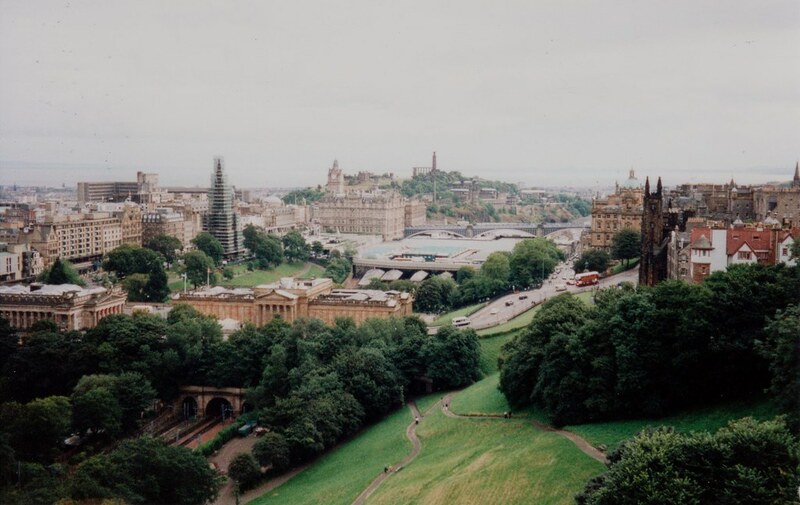 The tunnel had been proposed in the Eddington Study, released a few months earlier. Two people showing things you can’t (or at least shouldn’t) do while driving. 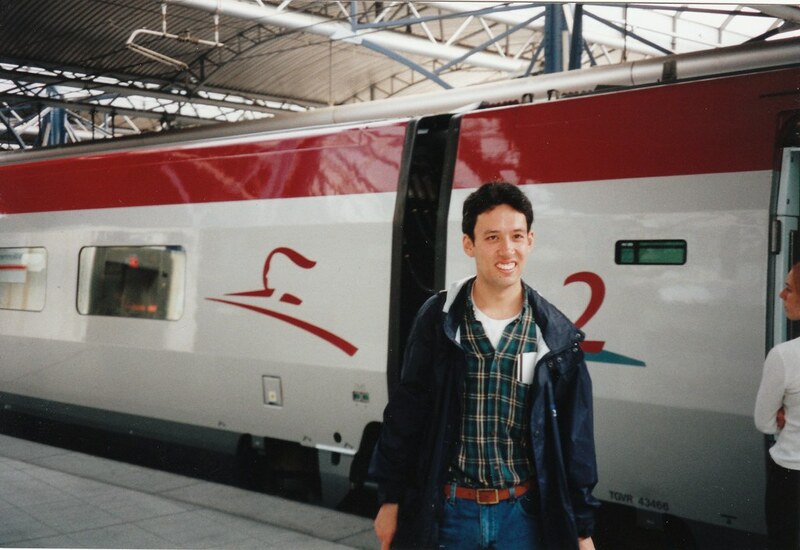 Note the clean wall of the Siemens trains – I guess this was before the period when they were regularly covered with tags. 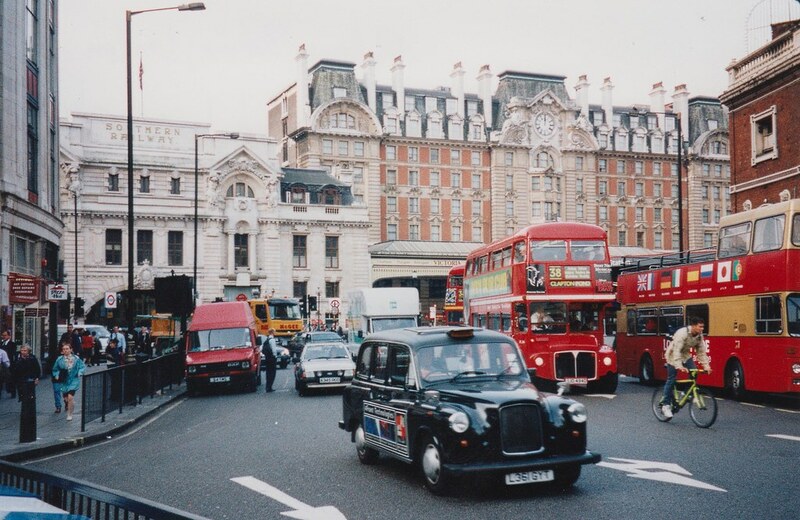 As blogged at the time, some genius remodelled the street in 2008 such that the taxi rank was split into two, forcing taxis out into traffic to move up the queue. It was fixed sometime later. 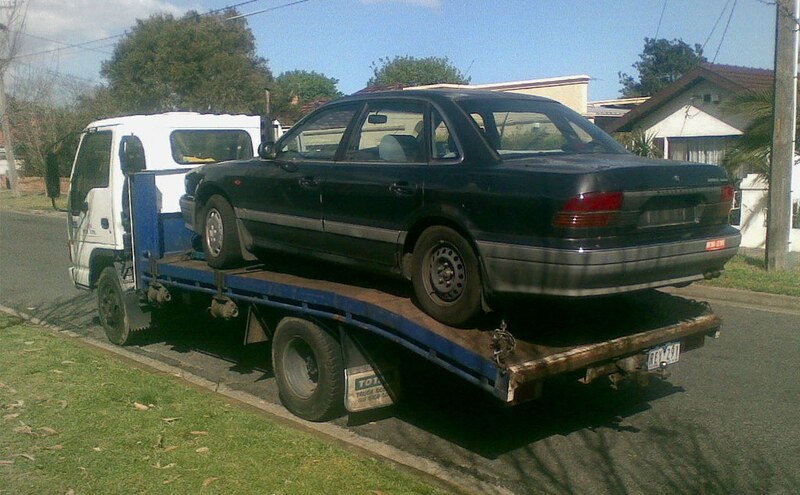 Also in this month, my old car (a 1993 Magna) got taken away for scrap. Allegedly the engine was destined for the Sudan to work a pump in a village somewhere. Cool. I believe it was also ten years since the last time I went to the Melbourne Show. 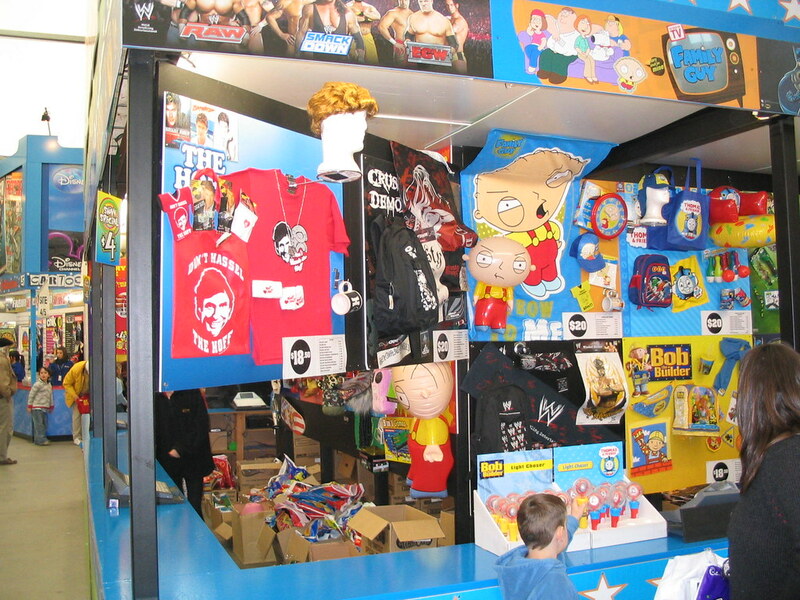 Here are some of the pop culture show bags on sale at the time. 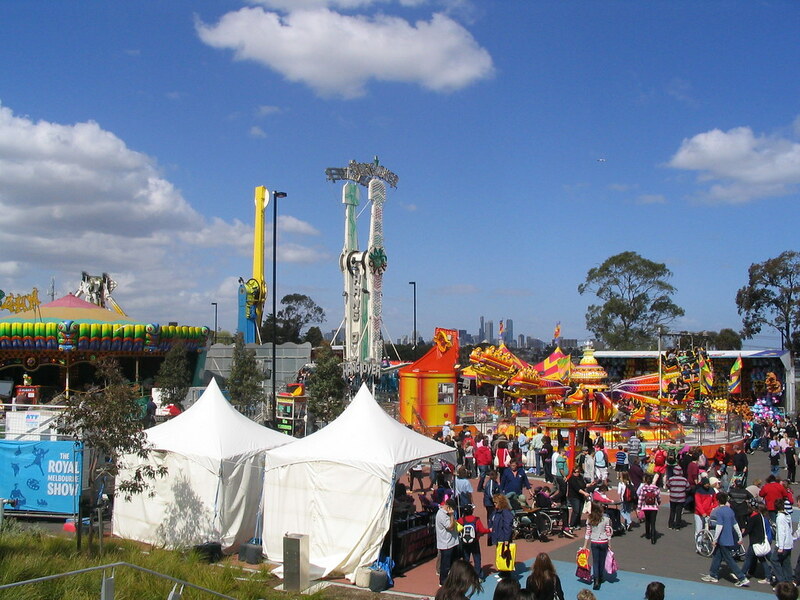 This view over the Showgrounds also shows the city skyline in the background. 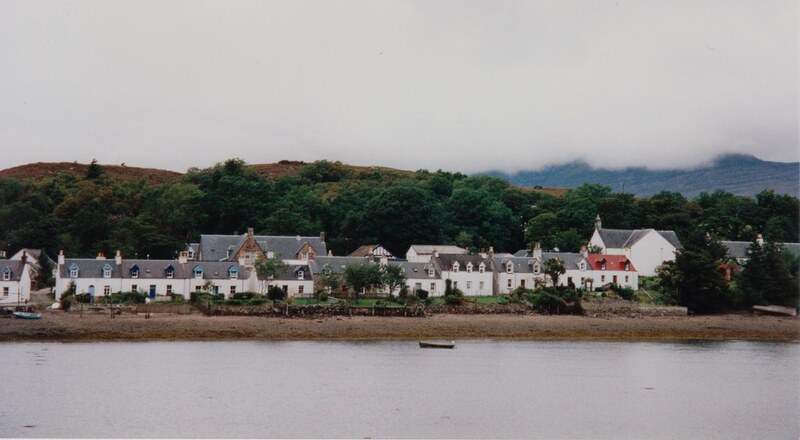 Rather fewer skyscrapers than now. 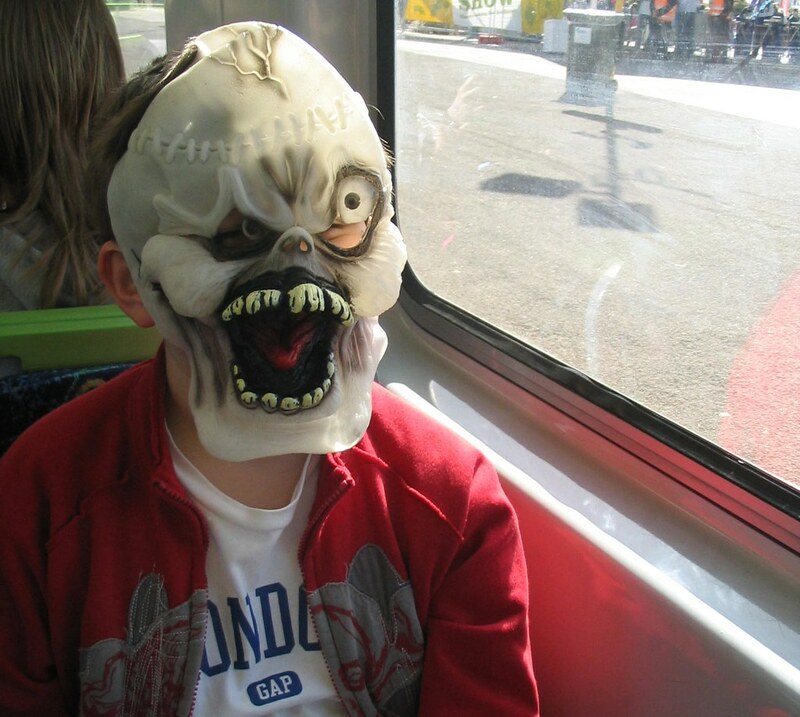 Younger son Jeremy riding the train home from the Show with one of his new acquisitions. That day also prompted a blog post about the lax attitude of Connex towards ticket checks. 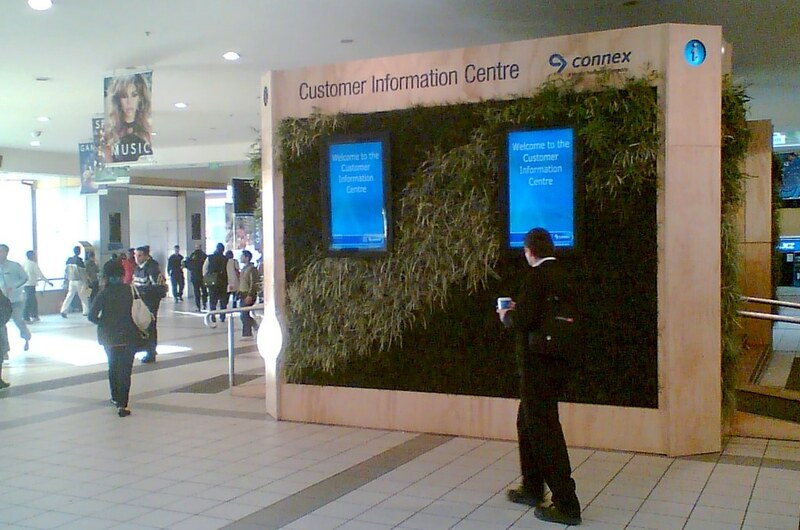 At Flinders Street station, then train operator Connex installed the first information centre. On the opening day I was there talking to a senior Connex manager (from memory it was then-CEO Bruce Hughes) when some footy fans asked us how to get to AFL Park (in Waverley). Thankfully we gave them the right directions. 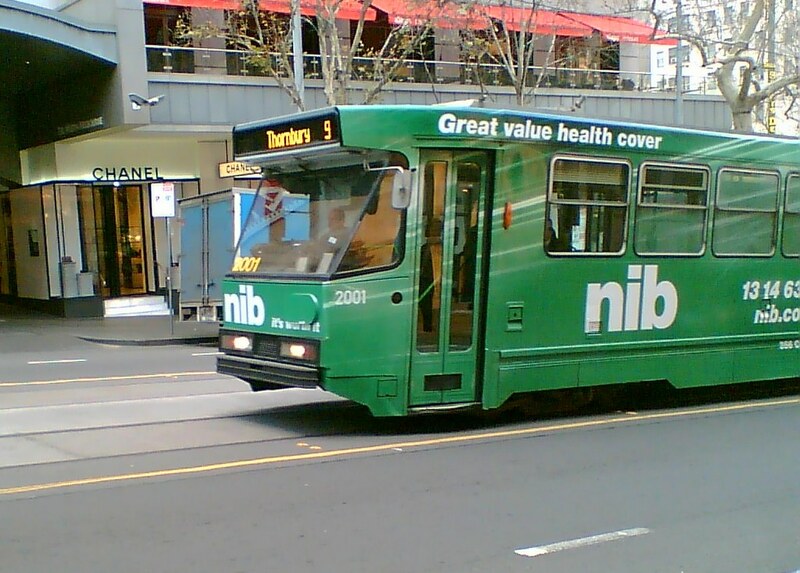 The centre itself got rebranded when Metro took over in 2009. 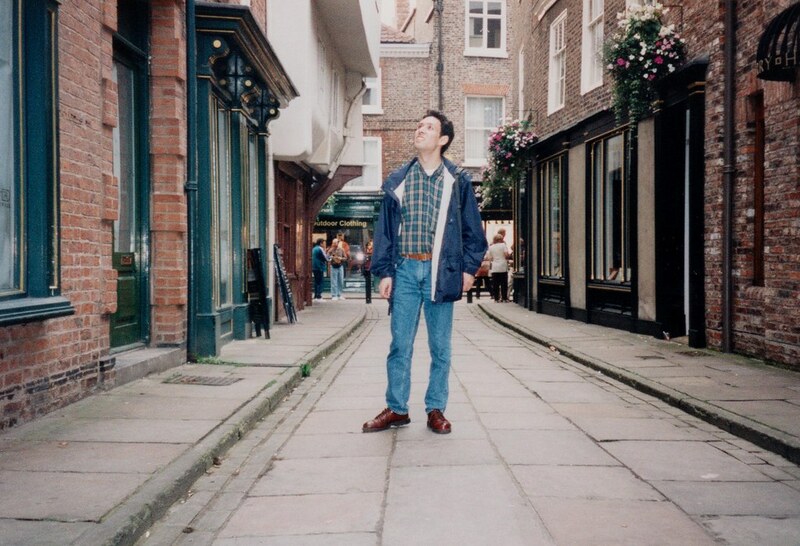 Here’s my monthly post of photos from ten years ago. 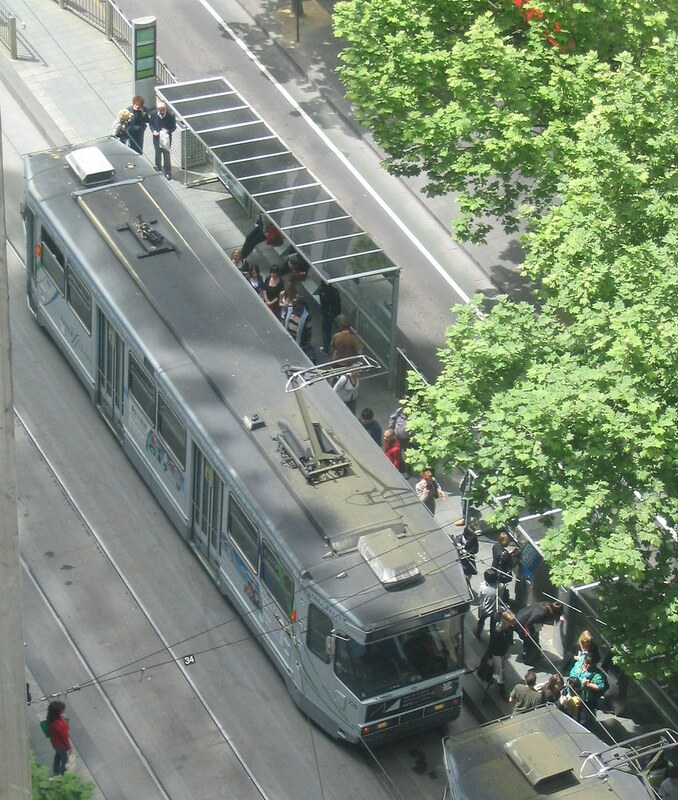 For a while I was waging war on ghost tram route numbers via this blog post and then this Age article. Numbers like 7 and 9 were pointless because nobody outside a few gunzels knew them. 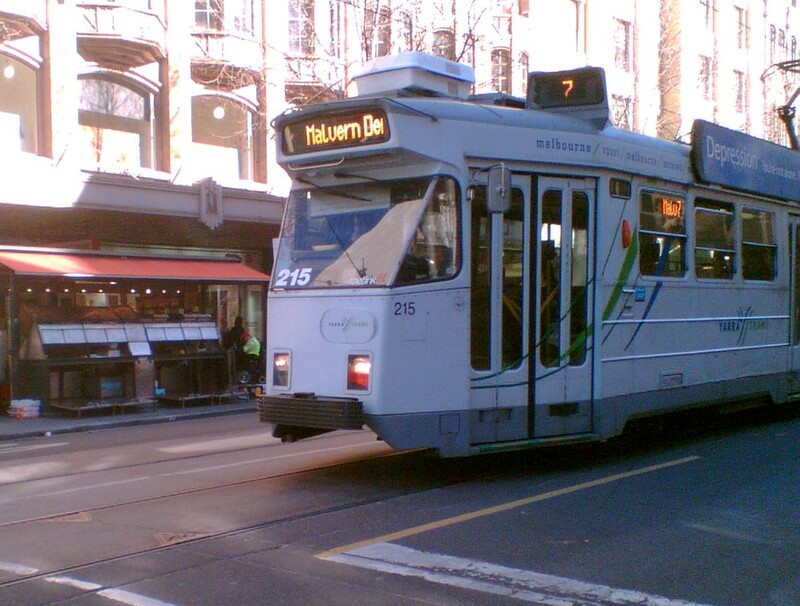 This was tram route 7 to Malvern Depot. 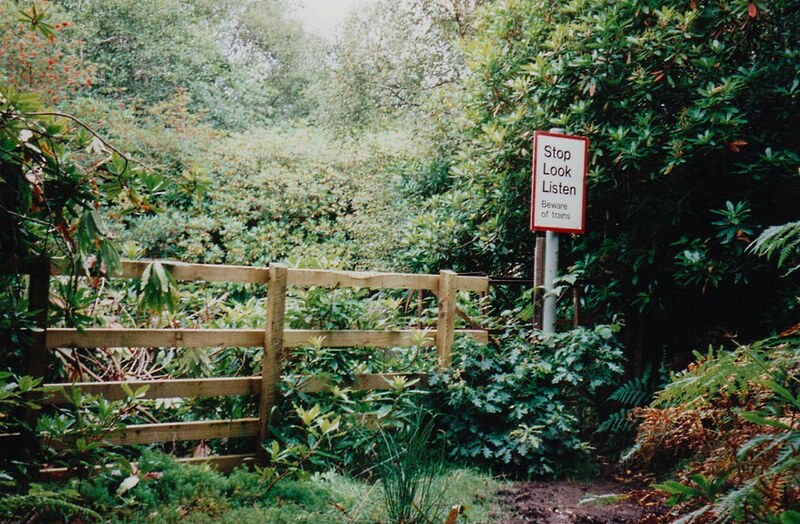 In 2011, all the obscure route numbers got renumbered to something people can actually understand. Route 7 followed route 6 as far as Malvern Depot, so today it would be called a 6d. Here’s route 9 to Thornbury. 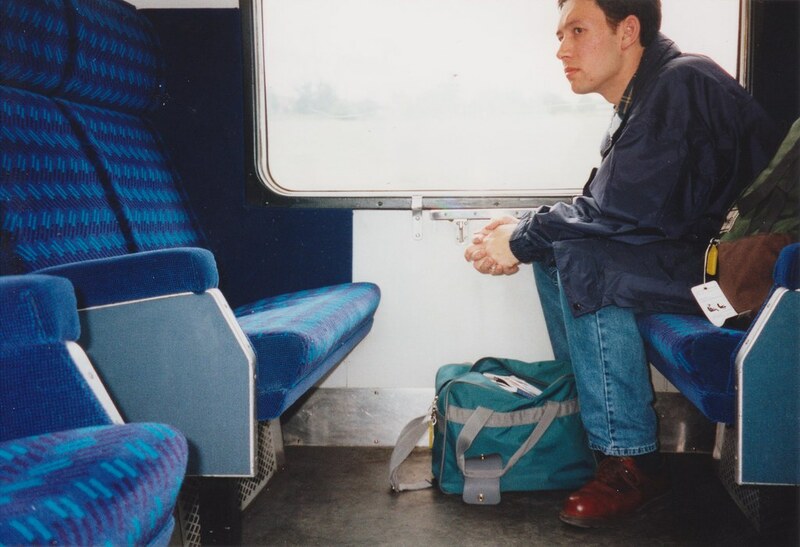 Today I guess this would now be an 11d. 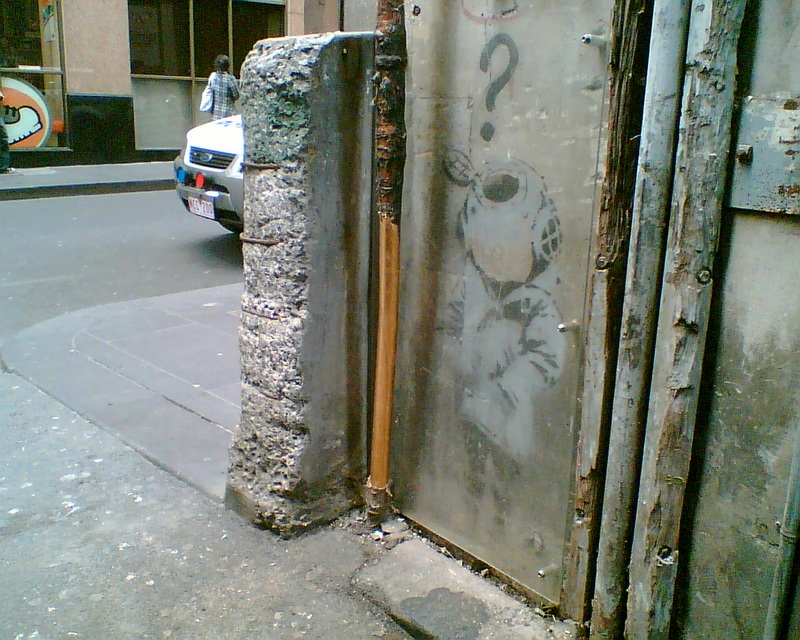 Banksy’s “Little Diver” had appeared in 2003 just off Flinders Lane. 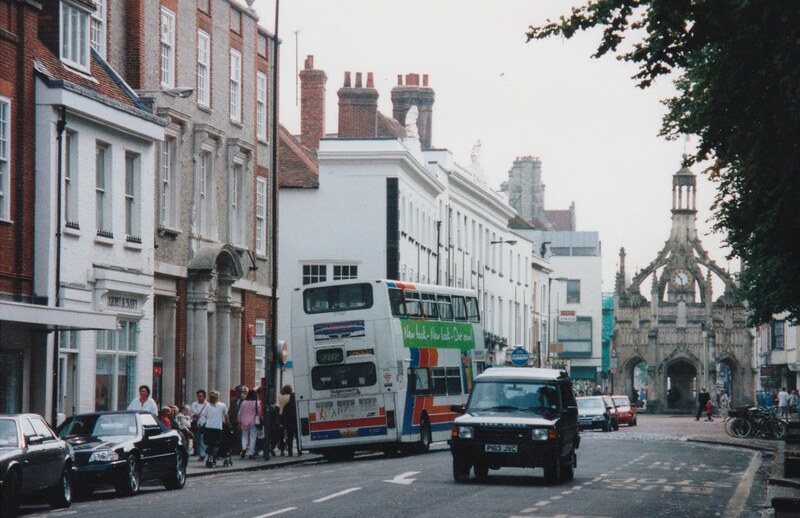 The building’s owners put some perspex in an effort to protect it, but it was subsequently destroyed a few months after this photo was taken. Massive Spirit Of Progress poster advertising the Art Deco exhibition at NGV. 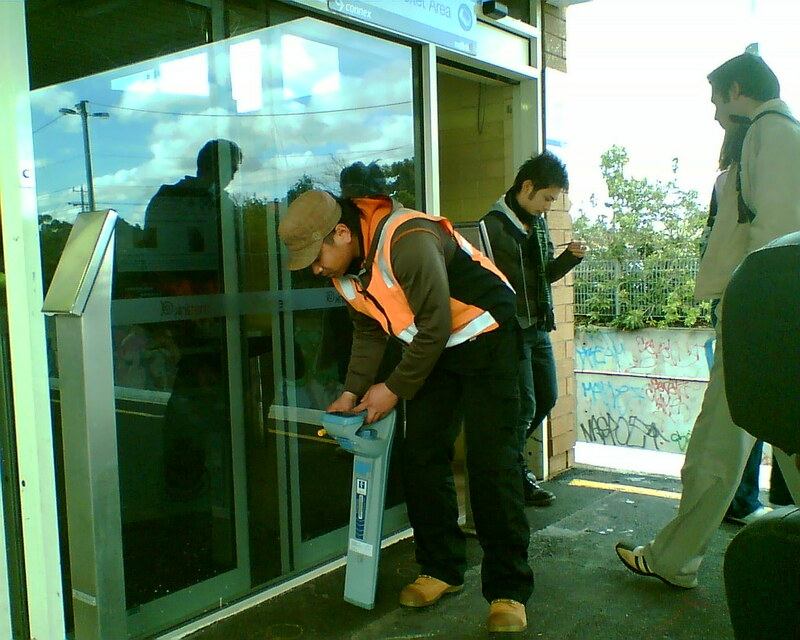 Bentleigh station: Some kind of work in preparation for Myki equipment installation. 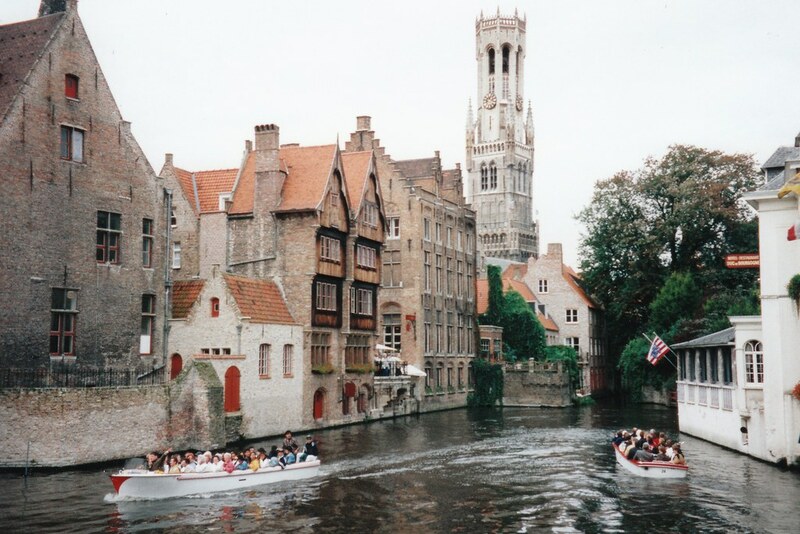 Note the mounting poles. 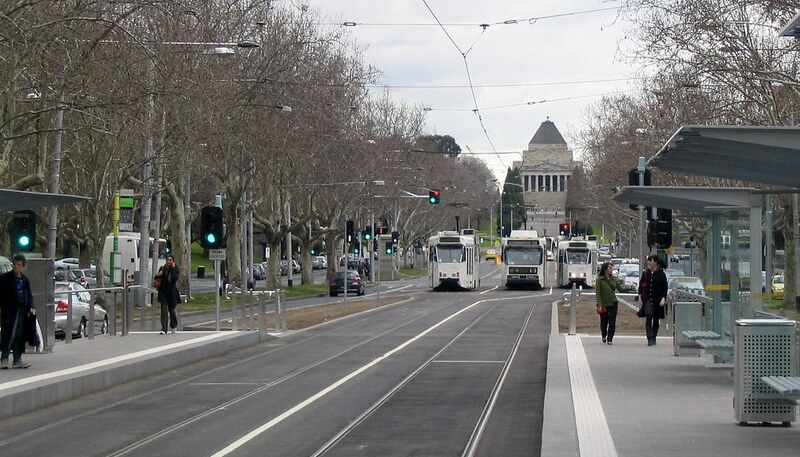 The system eventually got switched-on in Melbourne at the very end of 2009. 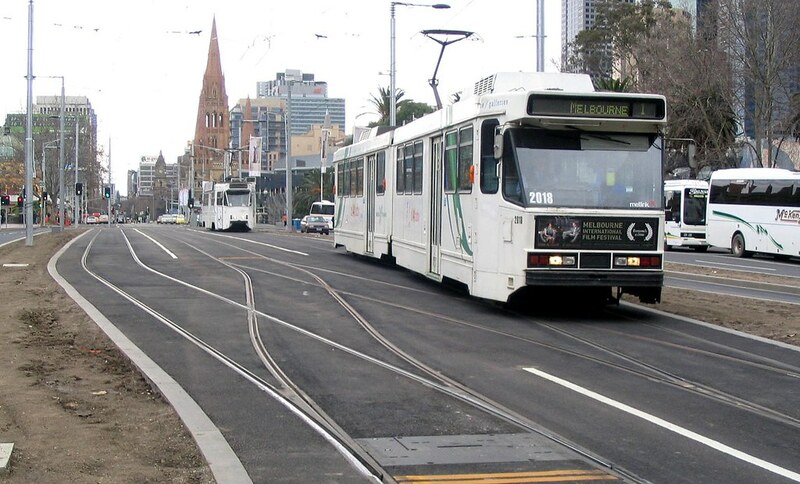 Back on the trams, this holding siding had just been built on St Kilda Road. 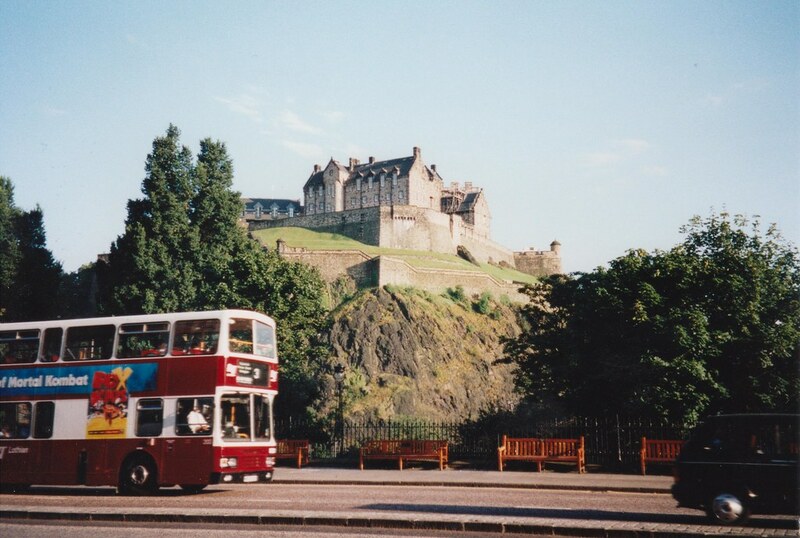 At first, some drivers seemed not to slow down sufficiently, so the trams would lurch in and out of the points. Hopefully they’ve improved since then. 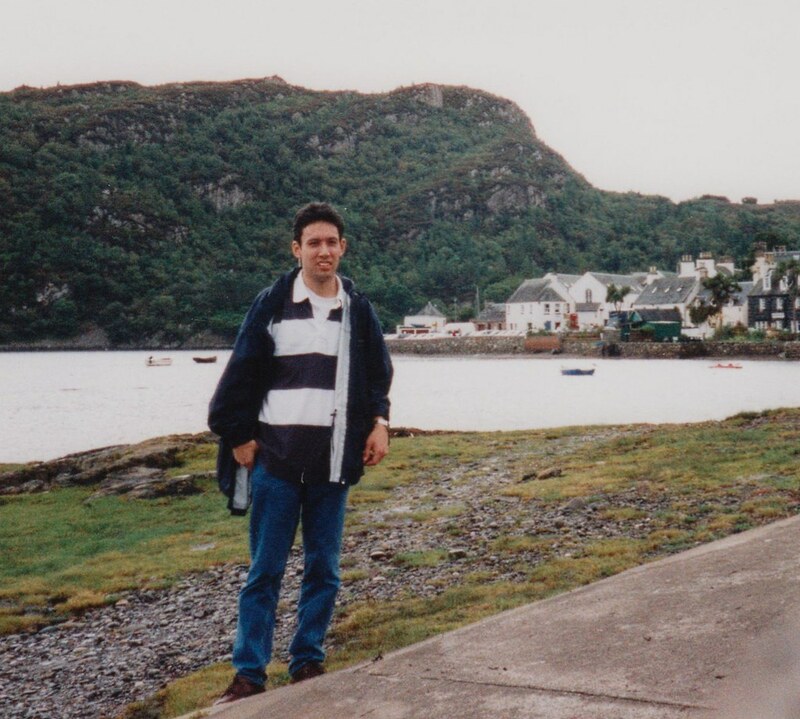 In August 2008 I got my “new” (2000-model) car. 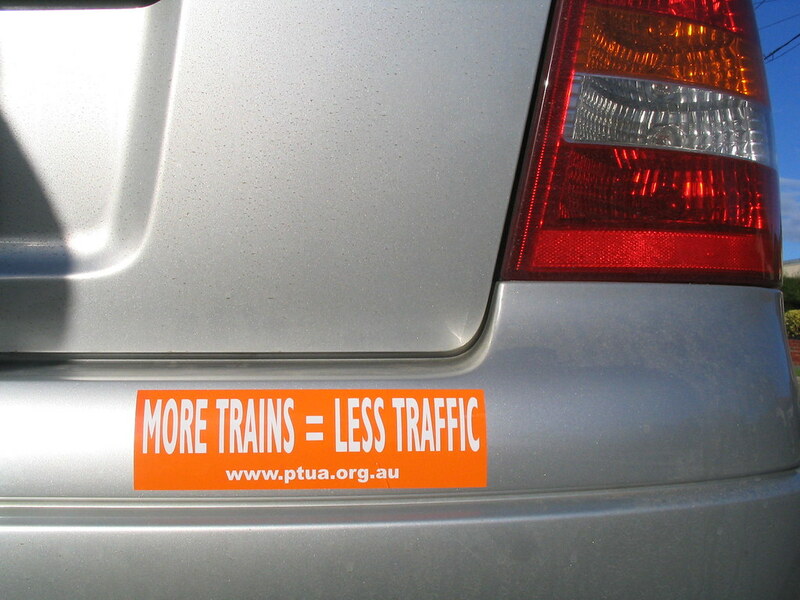 First order of the day was to put a PTUA sticker on it, something I did last month with the brand new car that replaced it. 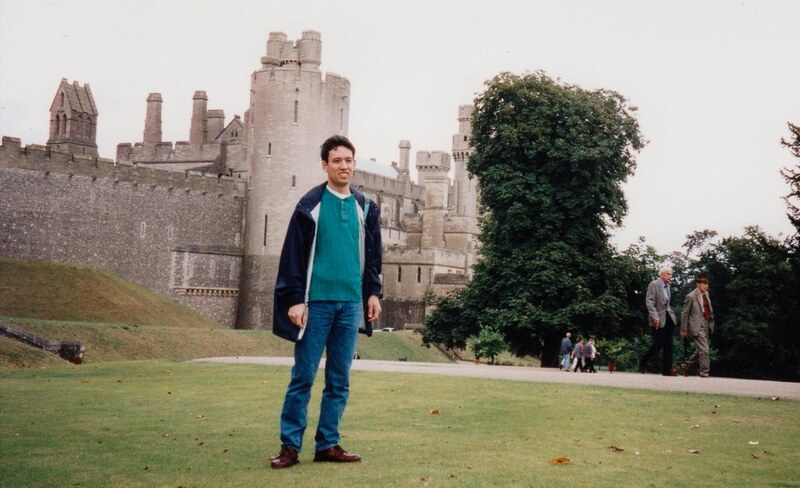 Back in December 2007, we’d gone to Spamalot, the musical. From this photo, it seems I subsequently found a can of Spam commemorating the show, though according to Wikipedia it had closed back in April. Let’s start with Melbourne Central. 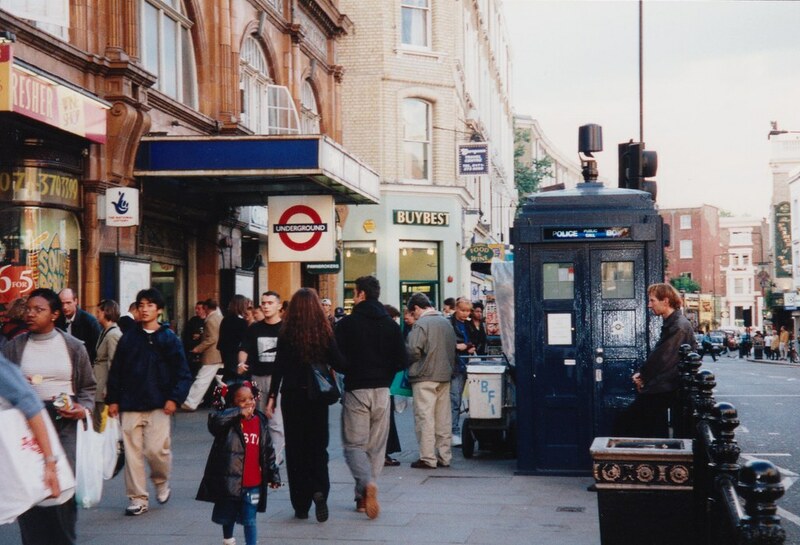 A few years earlier, the centre and station concourse had been re-developed to better integrate the shops with the station. 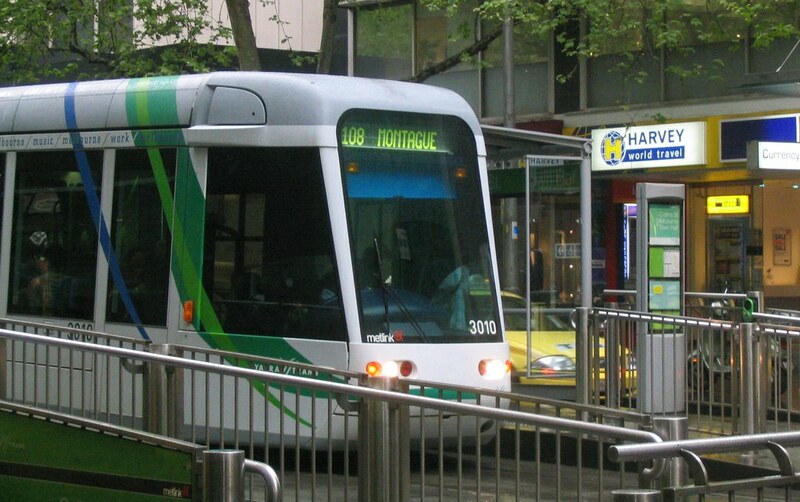 And by integrate, I mean funnel the passengers through the shopping centre instead of directly out to Swanston Street. What could possibly make it worse? Closing the entrance from Swanston Street for a movie premiere event (Mamma Mia). 5pm-7pm. 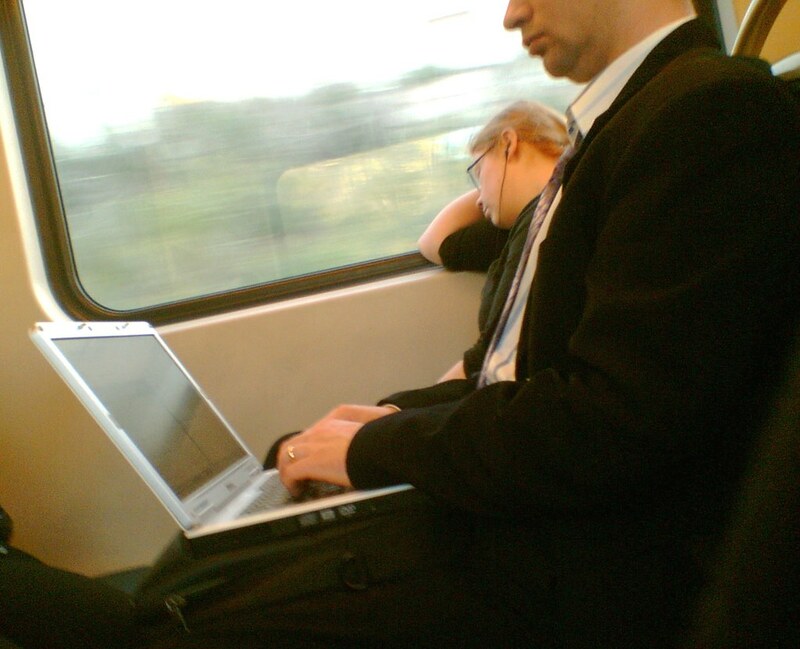 Yes, during peak hour. 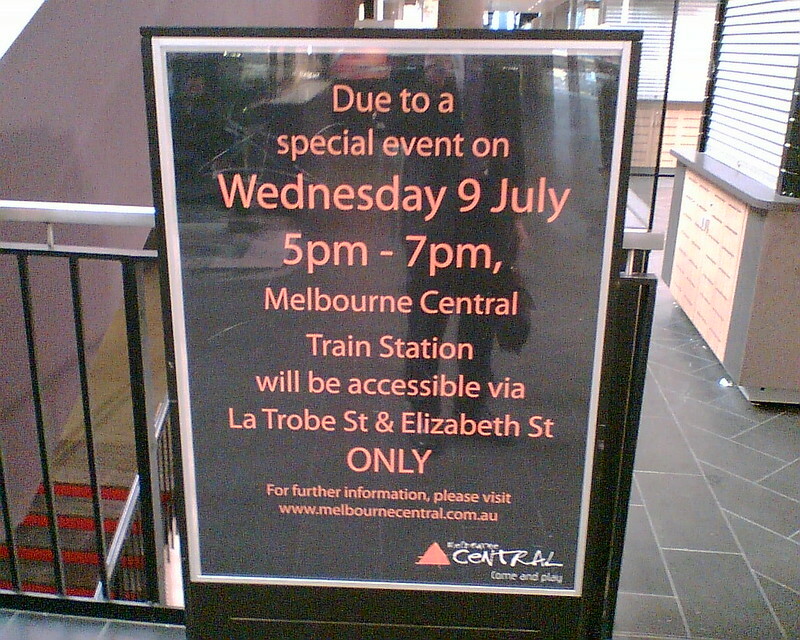 I have an email from the time that says after “some words with Melbourne Central from ourselves (PTUA) and a journalist” they altered their event so it only blocked Knox Place (which runs east-west from Swanston Street), not the pathway from the corner of Swanston and Latrobe. But honestly, the nerve. 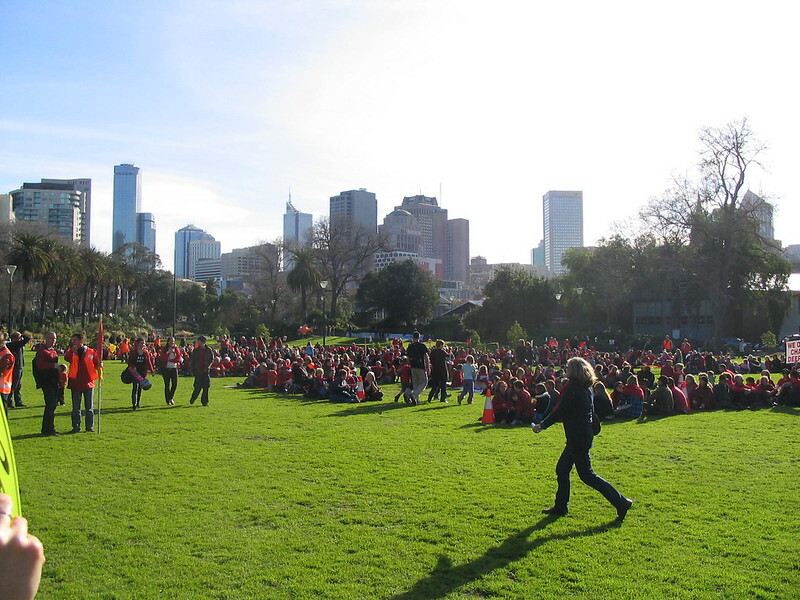 Gathering for a human sign to say “Climate emergency” in the Alexandra Gardens. 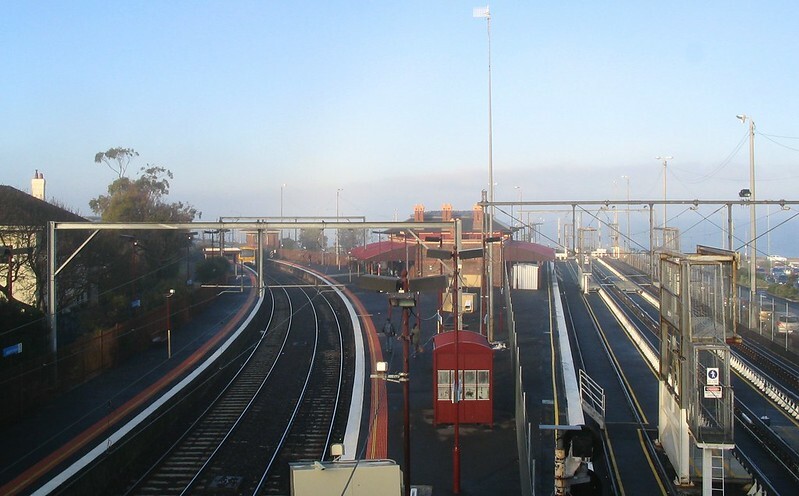 Brighton Beach station, with haze over the bay. 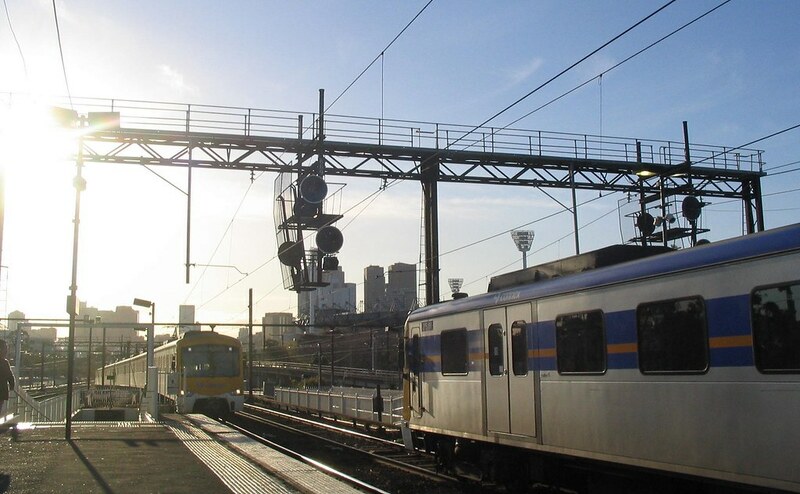 Note the equipment installed in the sidings; from memory this was for the “Concorde” project on the Comeng trains, to make the two types compatible again after their modification by different train companies earlier in the decade. 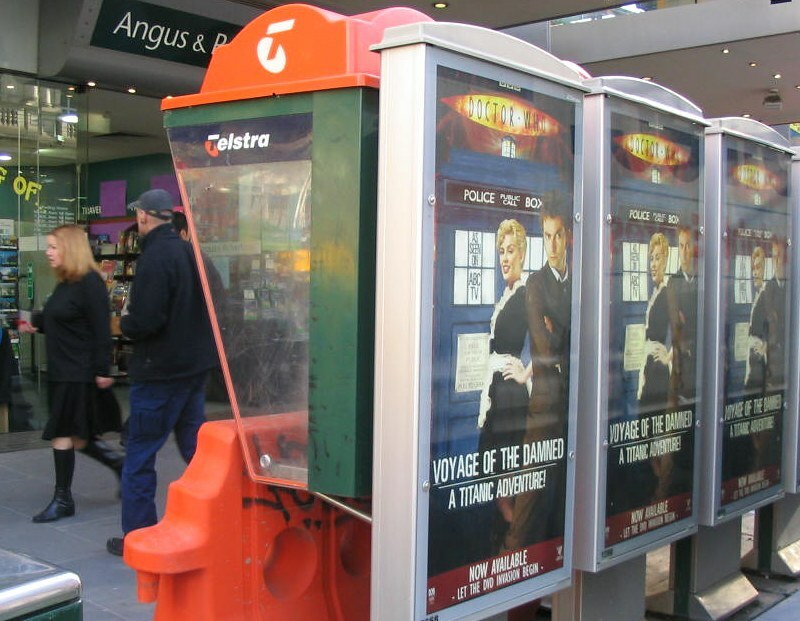 I knew Doctor Who had become mainstream when ads started appearing for it on public telephones. 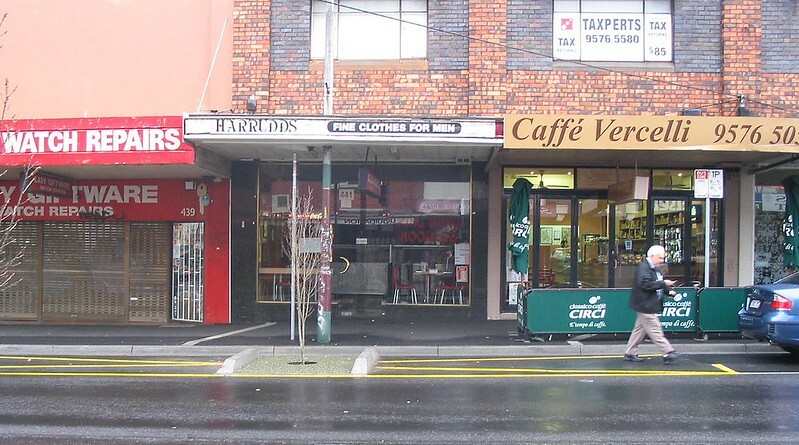 This is opposite the GPO – the Angus and Robertson book shop behind the phones has since vanished. 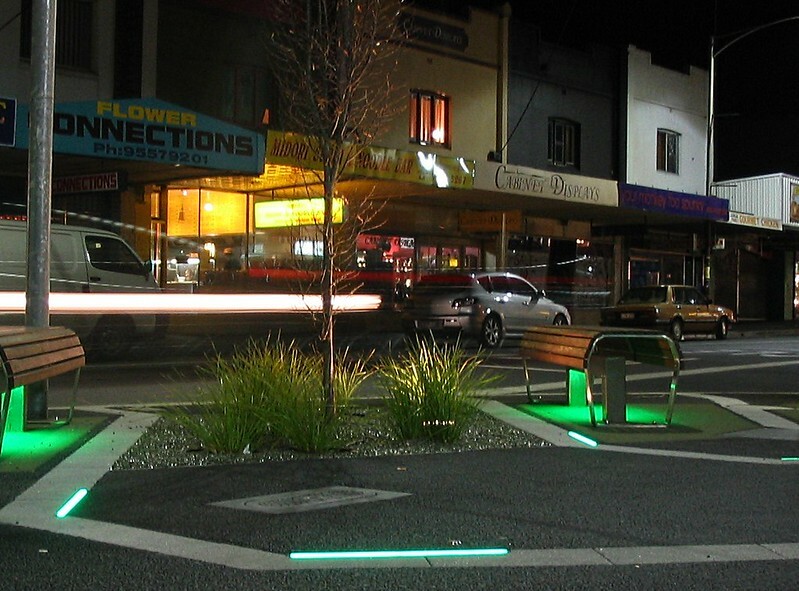 New street furniture was installed around my local shopping centre in Centre Road in Bentleigh. Not sure why the green lighting. 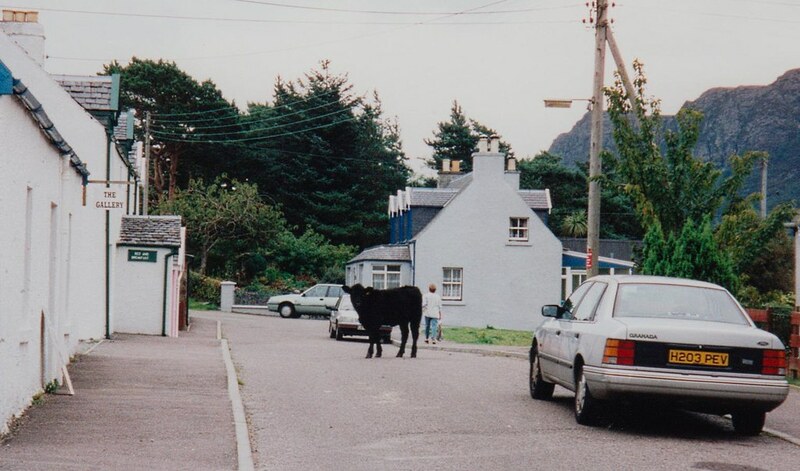 Maybe the council was expecting visiting aliens. 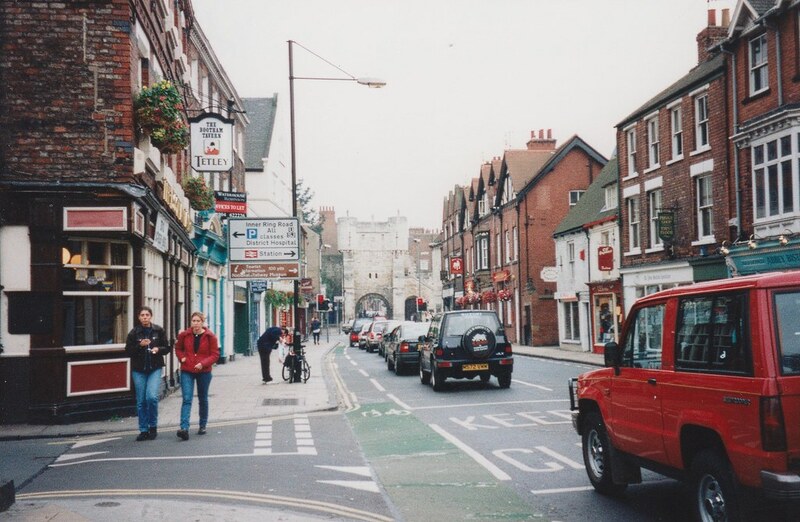 The street upgrade also included trees in the parking lane – in principle a good idea, but they managed to chop this bus zone in half. 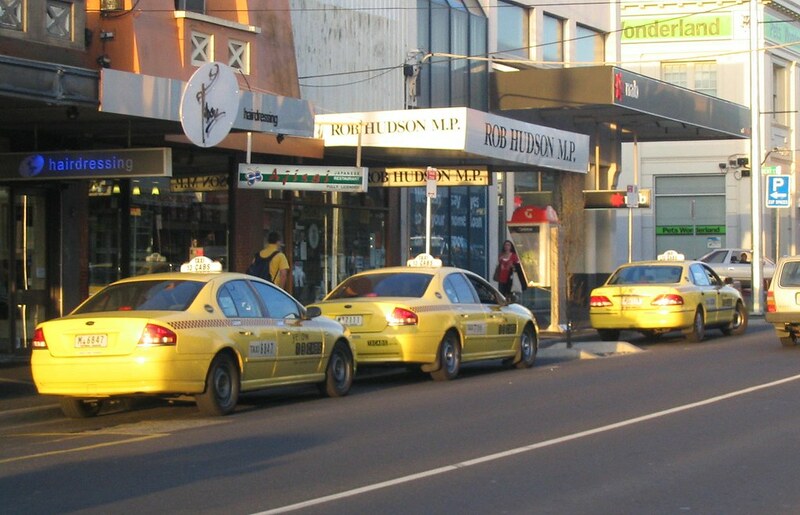 They also messed up the taxi rank near the station. 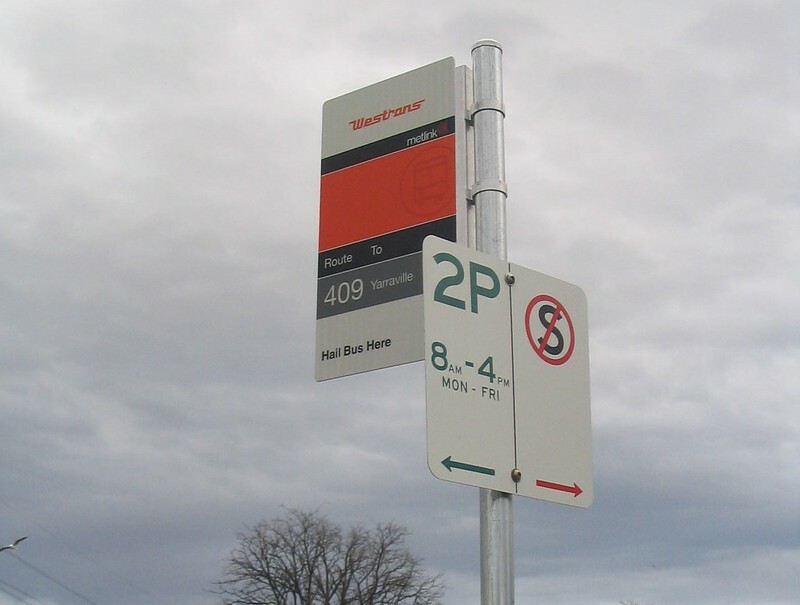 Also on Centre Road, the Smartbus sign for westbound buses, and the level crossing – since gone in the 2016 grade separation. 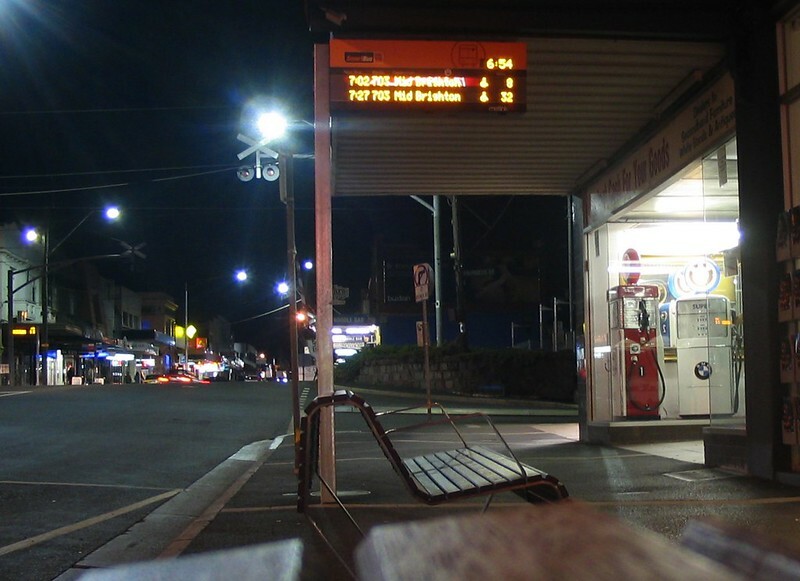 Over in Edgewater (Maribyrnong), they’d created a new bus route which didn’t even have any bus zones at its stops. 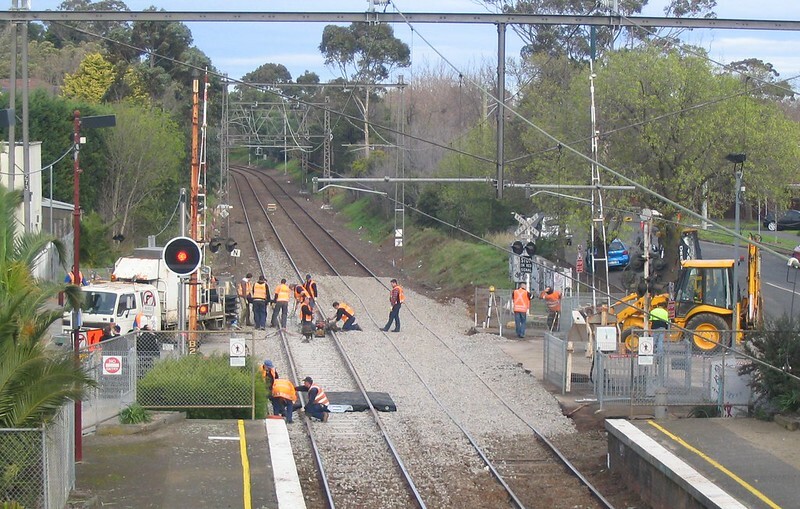 Rail works on the level crossing at Ripponlea.